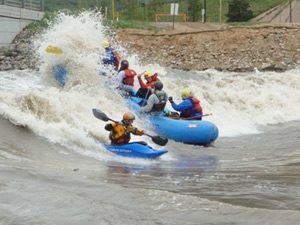 Welcome to the official website of the Glenwood Springs Whitewater Park. 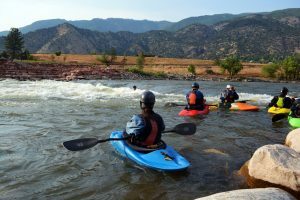 Located in Glenwood Springs, Colorado, the Glenwood Whitewater Park is the first man-made whitewater feature built on the entire length of the Colorado River. IMPORTANT!!! Parking/saftey notice- Parking has obviously become a big issue, let us all do what we can to help. NEW!!! Flow guide- The complete guide to water flows in the park, including photos at each level. NEW!!!! Video @ 20,000 cfs- Big water and still good. Rodeo Memorial Day Weekend! !- First whitewater rodeo held at park! Playboating glossary – Does kayaker slang seem like a foreign language to you? Fit in with those new age park rats by learning to speak their own vernacular! Guaranteed to make you feel more hip. Park builder- Build your own whitewater park with just one click! WHERE IS THE PARK? – See exactly where this feature is located, including satellite imagery. Detailed design/site analysis- Discover a detailed analysis of the site and the plans for the park. Sponsor Listings- Truly the ones to thank for making this dream a reality!